While getting the latest eyeshadow palette is always a euphoric moment, trying to stuff your beauty buys around every nook and cranny of your space can make your room resemble an episode of Hoarders. So, if you’re anything like me, than you may want to ignite your spring cleaning early — starting with your vanity. But, we know tidying up is much easier said than done, so we went to Professional Organizer Laura Cattano for some guidance. Below, check out some of the top tips for keeping your makeup stash as on-point as your #MOTD. Make your vanity look as organized as a Sephora by sorting out your stash by product. Cattano recommends putting your products into categories, so all of your favorite lipsticks stay together. Sort them out by face (primers, foundations, concealers, and powders), lips, cheeks, eyes, and tools. FYI: most cosmetics have an expiration indicator on their label, so keep that in mind when sorting through your things. If you can’t find it, then Cattano says that most eye products (eyeliners, mascaras, etc.) last for 3 months, while face products (liquid foundations, concealers, and cream blush) last 8-12 months. Eyeshadow palettes and powder blushes, on the other hand, last for 1-2 years. Organizing is only half of the battle, and cleaning your beloved products is always key to making them last without any fear of collecting acne-causing bacteria. Cattano suggests using a wet cloth to wipe down everything: products, drawers, makeup bags, and anything you use to store your cosmetics. Use rubbing alcohol to spruce up any metal tools, and wash your brushes with warm water and a gentle brush cleaner, allowing them to air dry overnight. 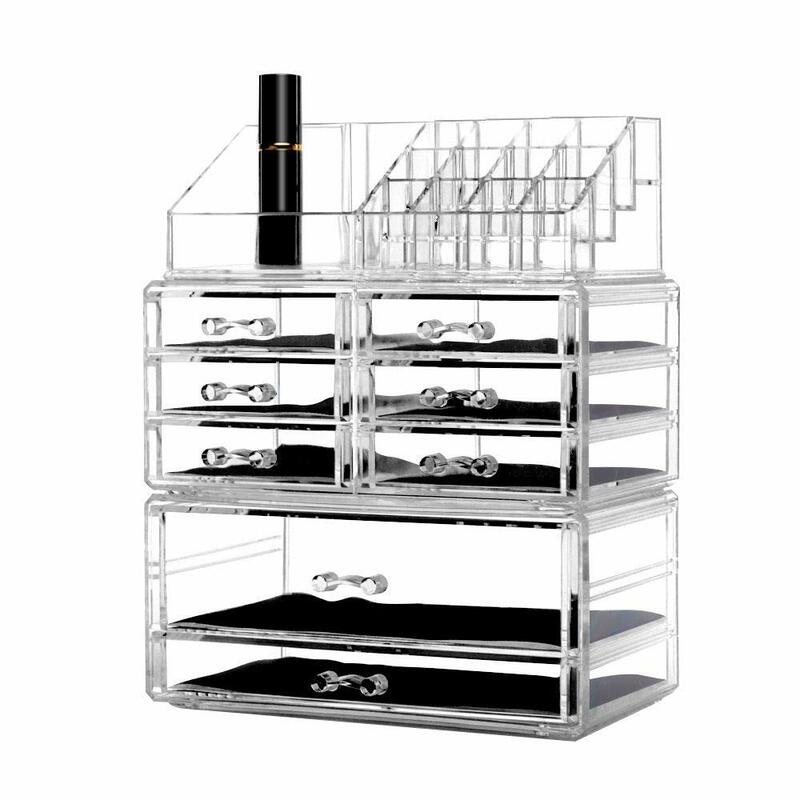 If you want to splurge on your vanity, then Cattano suggests stocking up on some clear acrylic drawers. Check out a few of our favorites, below.